We have the first summits of 2013 as the Sherpas have fixed the line to the summit from the South Col opening the gates to all the teams. Similarly, view the Tibetan rope fixers on the North are reported to be close. Climbing with the Sherpas from the South Col was David Tait making his fifth Everest summit. He summited at Friday, prescription May 10. On the South it took 13 Sherpas from 8 different teams worked together to get to the summit. I will have their names and teams later today. They are reported to be returning to Camp 2 now. The winds were reported to be moderate and temperatures cold. They were able to put anchors in for a second rope on the Hillary Step to avoid delays associated with this notorious section. David Liano and Samden Bhote arrived at the South Col at 12:30 pm. Now they are resting and at 9:00 pm tonight, Friday, they are planning to leave for summit attempt. Ang Jangbu reports that eleven sherpas from the fixing crew reached the summit today including IMG’s Pasang Kami (Phortse) and Tsheten Dorjee (Pangboche). Congrats to all these guys for a job well done. Sounds like the winds stayed pretty low and conditions were decent. The sherpas reported knee deep snow across the Traverse to the Hillary Step, so it is good—they broke a good snow trail across there (as opposed to rock slabs). alternate descent route (climber’s left of the Hillary Step), so that will enable the second rope to be put in place up there. We are hoping to send the first wave of climbers up from BC in the next couple days, depending how the forecast looks. Twelve of our Sherpas made a load carry to camp three at 8,300-meters yesterday and today they will once again repeat this carry. Upon reaching high camp yesterday they watched the Tibet rope fixers close to reaching the summit. We have no official word if they fixed all the way to the summit but we hope so. If not completed yesterday, the Tibetans should finish the job today. Now climbers from all the teams shift their focus to the weather. They are looking for a 4 to 5 day period of low winds. They will leave Base Camp, spend a night or two at ABC on the North or Camp 2 on the South, then the high camps over the next two days before their summit attempt. The return usually takes two nights. The team from Himalayan Ascent is already at Camp 2 trying to get a jump on everyone else. The big question is if the winds allow an early attempt. Most teams are looking at mid next week when the next lull spot begins. Congratulations to all the climbers today and of luck to those on their way. Alan, what’s happening on K2 right now? Doesn’t the climbing season there coincide with the one on Everest? The K2 season and most climbs in Pakistan do not start until June/July. But there are occasionally winter climbs. This is amazing! Ive always wanted to climb a mountain! I hope all the climbers reach the summit safely. How do you get all the information Alan? Are you in Nepal or are you following sites? Also how old are you and how old were you when you began to climb? And finally, How did you gather enough money to climb all the 7 summits? 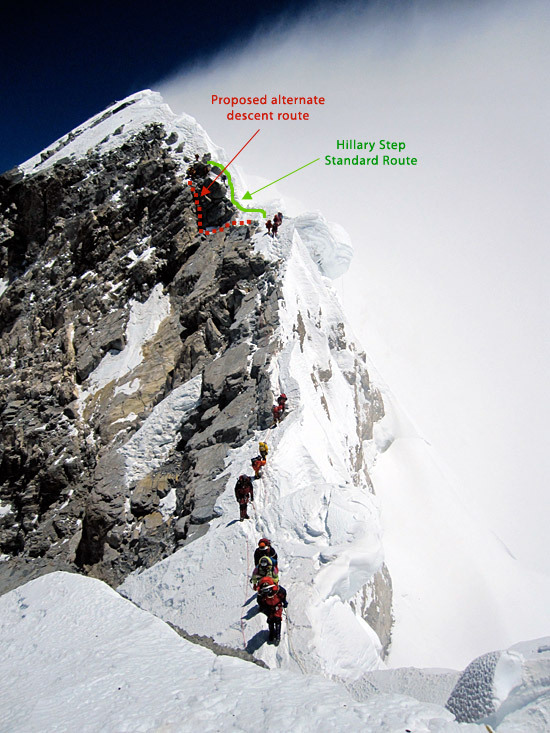 the extra rope at the hillary step will literally be a life saver, reducing delays at this bottleneck, will mean quicker ascents for people further back and quicker descents…. less time high on the mountain. less risks from health issues…. it should help keep the death toll down. This is so very exciting! Congrats to David and the Sherpas! “11:49hrs- Phurba Tashi (20 times) now, Nawang Thenjing, Nima Tenjing, Gelgen Dorjee. Phurba Tashi, been waiting for that name to pop up! Met him about five years back, glad to hear he summited safely. Alan, really appreciate for keeping us updated daily. Congratulations to David for his 5th summit. 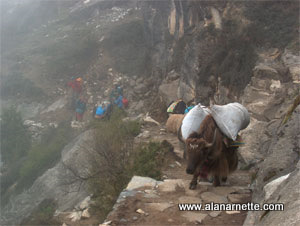 To all the Sherpas involved in rope fixing – a pat on their back for a job well done. Pretty cool huh? Look for the big push to start on May 19th. Will publish a detailed post of the factors today or tomorrow. Great News ,Alan ! Well done to the Sherpas and David Tate ! I hope that all teams get to summit and get down safely ! So inspiring and exciting! whoot!